_Kevin Pettelle with 5th grade students 2010. 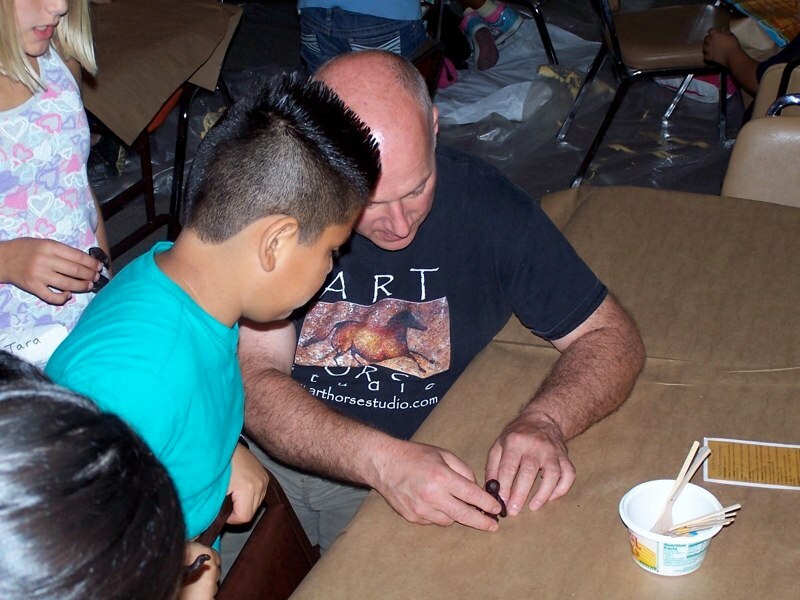 Sculptures came to life for fifth-graders in Wenatchee School District when artist Kevin Pettelle led students through a day of exploration and creativity during the “Beauty of Bronze” program. For each class the day started at the Performing Arts Center, where Pettelle’s work is on display. Pettelle talked about the process of creating bronze sculptures, and his career as an artist. He taught sculpting techniques that would be put to use later in the day. Next came a walk across the pedestrian bridge to the sculpture garden in Riverfront Park. 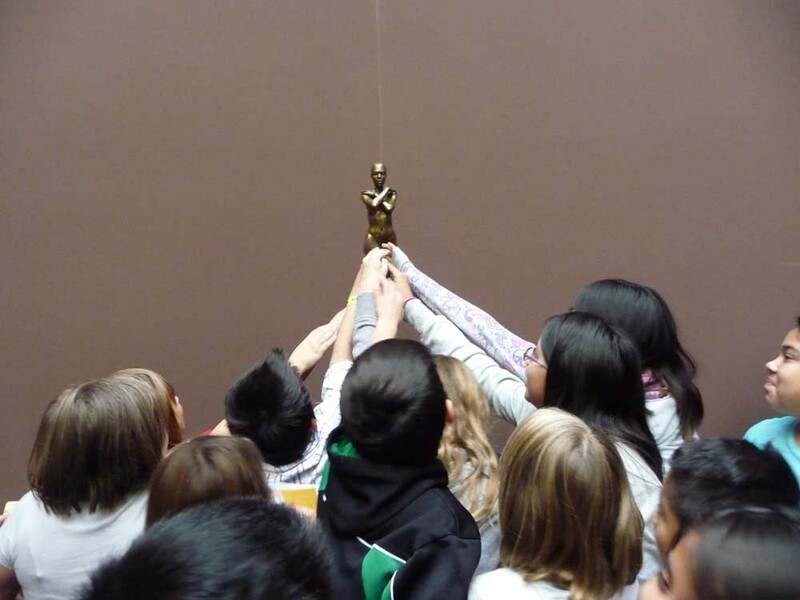 Kids had the opportunity to touch and interact with the sculptures and learn about each one. Another of Pettelle’s works — “Ped” — resides amidst a host of bronze sculptures from several artists. Pettelle talked about the thought and design behind the sculpture. He may be a dreamer, but he also brought up the techie side of art. “I can’t emphasize enough the importance of technology,” he said. He talked about digital sculpting software like Sculptress (which is free) and Z-Brush, and the huge role technology has in the creation of sculptures. Next the kids participated in an Andy Goldsworthy Challenge. Goldsworthy is a British artist who uses natural materials — like leaves, bark, rock, feathers, twigs — to create outdoor sculptures. He photographs his works before they disappear back into the natural world. The kids worked in groups to create their art from natural materials. Photographer Kathryn Stevens documented their creations in photos. 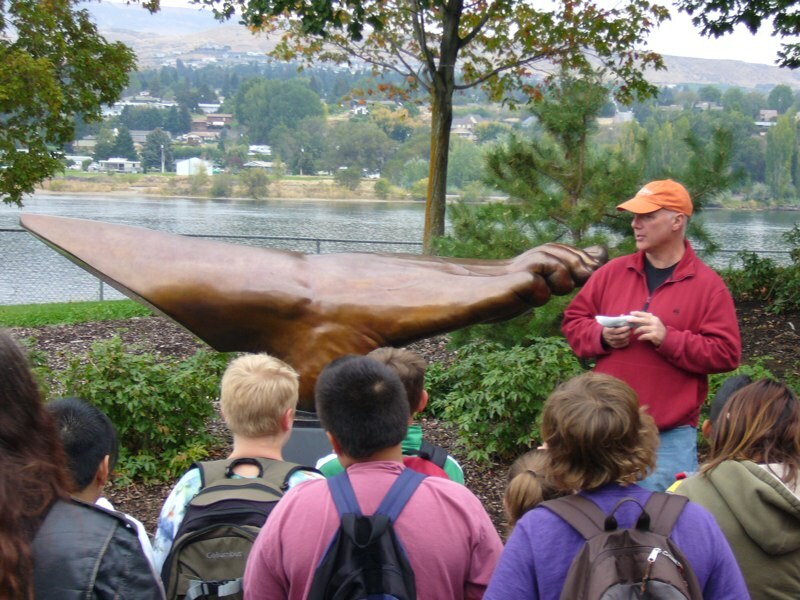 Finally the students walked to the Wenatchee Museum and Cultural Center, where they had the chance to craft their own sculptures. They created in wax. Their sculptures were later bronzed and fired by volunteers, and will be on display at the museum, then returned to the students to keep.